National Qaid Education Mr Rana Khalil outlining the details of program While Sadr Ansarullah and Niab Sadr on stage. 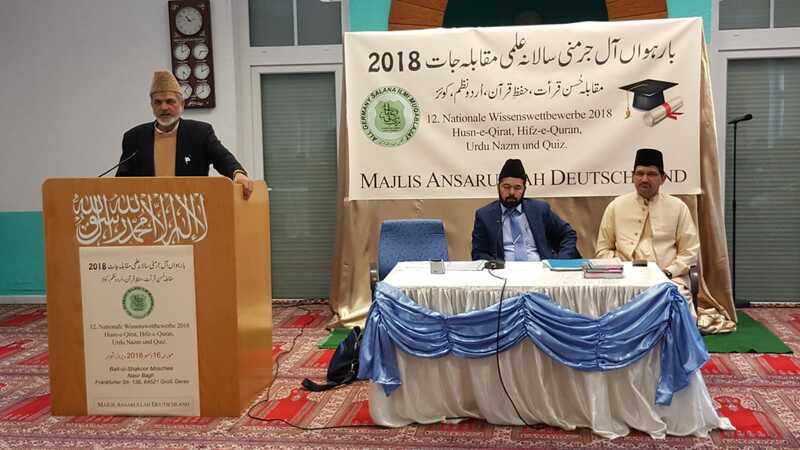 Majlis Ansarullah Germany organised its 12th Annual Ilmi (Educational) competition under the supervision of Ansaullah Talim (Education) Department on 16 December 2018 in the premises of Nasir Bagh Gross-Gerau, a famous Jamaat property in Germany. Organisational arrangements were amicably made by National Qaid Talim (Education) Mr Rana Khalil. 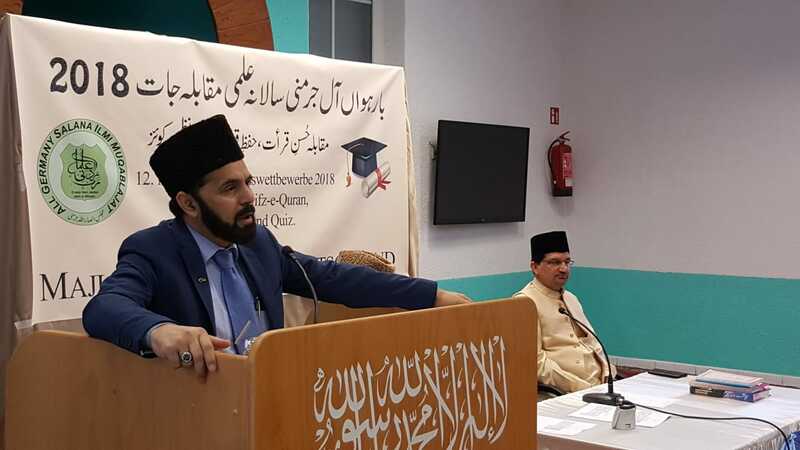 Mr Mobarak Ahmad Shahid, National Sadr Majlis Ansarullah Germany, delivered the opening address and started the program with silent prayers. 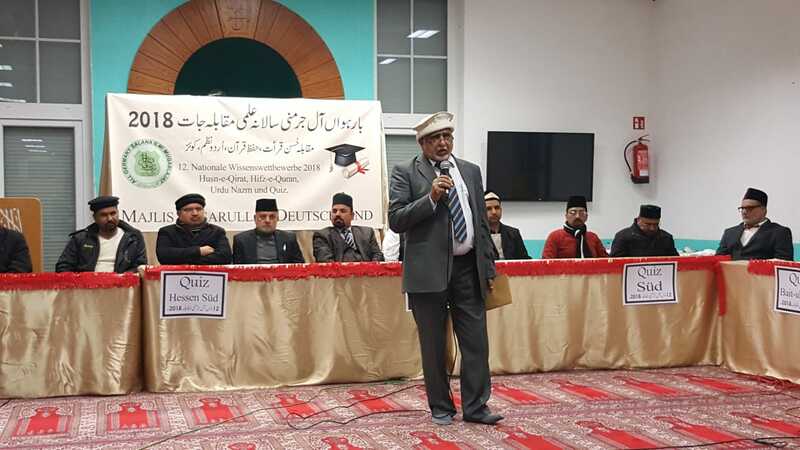 More than 250 members participated from 10 administrative areas called Alaqa comprising of above 257 local Ansarullah Majalsis spread all over the Germany. Four areas were selected for competition. Husne Qirat (Recitation of Holy Quran), Hifze Quraan (Memorising Holy Quran), Poem and Quiz program out of 250 questions taken from promised Masiha a.s. Book Haqeeqatul Mahdi, Friday Sermons and speeches of Hadhrat Amirul Momineen (May Allah be his helper), General and Religious knowledge. Specific portions of Holy Quran and poems were earmarked for recitation, memorising and poem competition. Judges busy in assessing the competitors. Interestingly 123 out of 250 Ansars arriving from all over Germany participated very enthusiastically in all the competitions. Mr Mujeebullah Mangat topped the recitation and poem competition while Mr Abbas Ahmad topped memorising the Holy Quran. Most interesting part was quiz program. 10 tables according to administrative Alaqa (Area) were beautifully decorated for each team. Each Alaqa (area) was permitted to participate with 3 members team. Mr Nayyar Iqbal who is seasoned moderator conducted the event in a very interesting and nice manner. Dr Wasim, the special assistant to National Sadr Ansarullah judged the competition. Ten Teams allotted specific table for Quiz Program and Mr nayyar Iqbal Moderating the program. Alaqa (Administrative Area) Nasir Bagh was lucky to bag the first position with Alaqa Baitul Jame and Alaqa Nord to follow 2nd and 3rd position respectively. 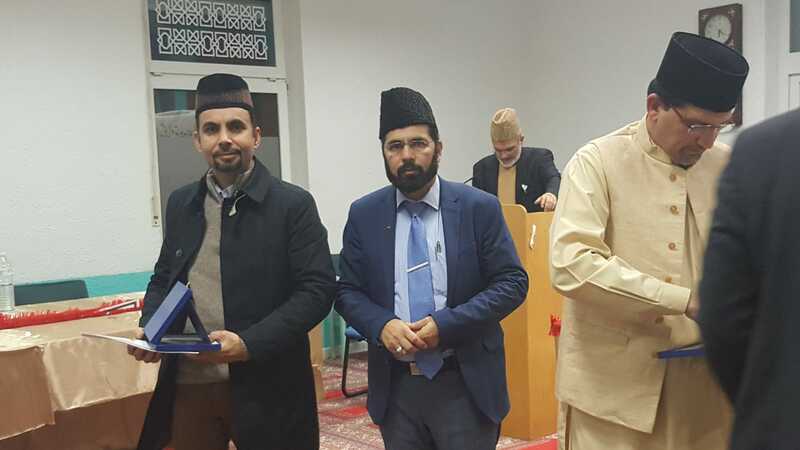 Naib Amir Moballigh Haider Ali Zafar and Qaid Tarbiyyat (Religious Training) Ansarullah Moballigh Tahir Hussain Bukhari were honoured to conduct the Recitation, Memorising Quran and Poem competitions. 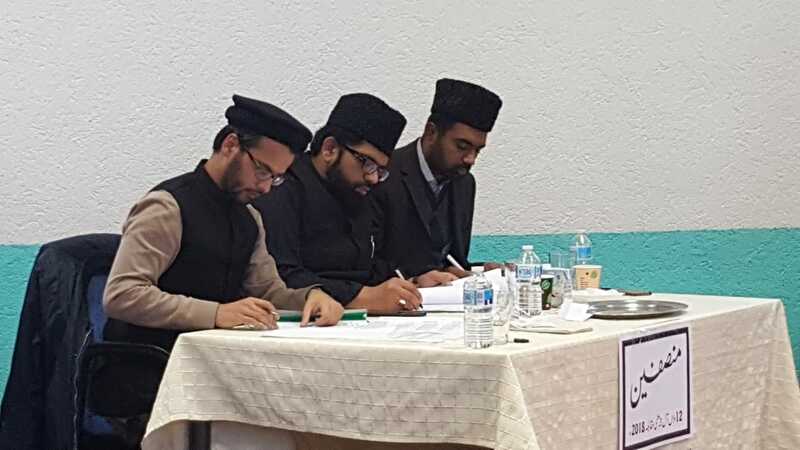 Moballigheen Basit Tariq, Fateh Ahmad, Shamsul Haq, Bilal Chatta and Dr Wasim performed as Judges for various competitions. So Happy to be blessed with First Prize in Quiz Competition. After prize distribution National Sadr Ansarullah thanked all the members for their active and enthusiastic participation in the competition. With silent prayers led by Sadr Ansrullah the event concluded successfully. National Sadr Ansarullah Mr Mobarak Ahmad Shahid speaking to participants. It was pleasure to attend this informative program. Mashallah.